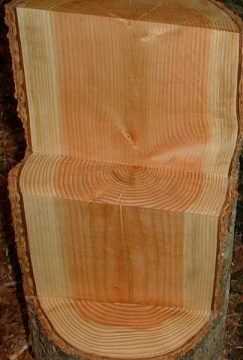 Is Poplar Wood Safe For Parrots? Is Dogwood Safe For Parrots? Is Driftwood Safe For Birds? Is MDF Safe For Parrots? Are Cherry Pits Toxic to Parrots? Can birds eat cauliflower leaves as well? Is Asparagus Safe For Parrots? Is Mango Good For Parrots? Are Mango Trees Safe? Is Nutritional Yeast Safe For Parrots? Is Hummus Safe For Parrots? Are Mealworms Safe For Parrots? Is It Ok For Parrots To Drink Milk? Browse the table of contents for information (based on research) about the safety or potential risks for parrots for various types of plants, foods, wood, household items and anything that a bird in captivity could come into contact with. Unless the evidence is clear, such as the case with avocado and chocolate (amongst several others), information is presented based on the research and expert opinions available. Many things are controversial when it comes to their safety or hazard potential for parrots, but often there is little evidence or knowledge either way, leaving it up to caring parrot owners to make sensible and considered decisions. In cases where the suitability or potential hazards are debatable, this is stated and wherever possible, links provided to expert opinion (preferably veterinarian or scientific studies). There are hundreds of factors that can cause something to be dangerous to a bird (consider: quantity, quality, the bird’s general health, the parrot species; just to name a few), and there is rarely a black and white “100% safe or not safe” answer besides in cases that are well known amongst parrot owners (and clearly also stated in this article). Sticking by the golden rule of “if in doubt, don’t” can give people peace of mind that they are providing the best for their birds, without unnecessary risk. A common hardwood in the United States where it naturally grows in the eastern part of the country, poplar wood comes from the Liriodendron tulipifera tree. This tree has various common names, like tulip tree (because the flowers are similar in appearance to tulip flowers), fiddle tree, yellow poplar, and whitewood. The hardwood commercially known as poplar is not taken from trees in Populus genus which are also commonly called Poplar. 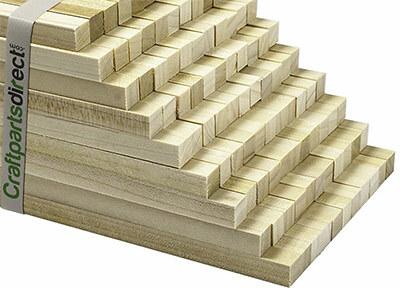 Poplar wood is one of the most affordable hardwoods you can buy in the USA. It’s often used for plywood and other applications where the appearance of the wood isn’t important. The Wood Database notes that when cut, poplar “can sometimes leave fuzzy surfaces and edges” and they note this is a downside for people working with this hardwood – but for parrot people wanting to make toys, this isn’t necessarily a bad thing. Rough wood blocks can be a highly desirable chewable object for birds like cockatoos. Very rough edges can always be sanded down a little where necessary. Buying raw untreated poplar wood pieces can provide low cost toy parts or used as a base for parrot stands – there are lots of possibilities of what can be done with this type of wood. One example of what can be bought are unfinished square dowel rods like these ones (note: any wood bought needs to be confirmed as untreated like these pieces are. That means the wood is pure and raw and has not been chemically treated or had paint, lacquer or any other substance applied to it). If you are wanting to make larger toys, or build stands, then larger pieces of poplar will be required. Having your own supply of poplar wood for perches and toys can be very rewarding; but as with all tree growing, patience is required to get to the stage of being able to harvest quality wood from your trees! Poplars are a relatively fast growing tree compared to many others, and can also grow very large in their natural form. However there are many cultivars (horticultural varieties) available that have been bred to have different characteristics. There are dwarf poplars (potentially ideal for growing in aviaries), types that grow faster, and some that have been developed to flower later or earlier than usual. 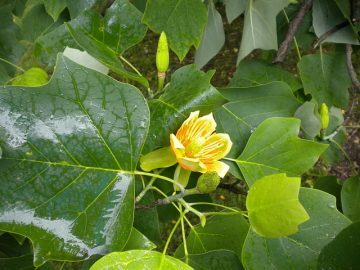 Seeds of Liriodendron tulipifera can be bought online. Or you can visit your local plant nursery who can give specific advice on how and what to grow in the climate and environment where you live. For those with the time, patience and space to grow their own trees like poplar, captive parrots can reap the benefits of having a natural and safe source of wood and foliage – Poplar is a safe plant so it’s more than just the wood that parrots can enjoy. Balsa wood is one of the most interesting wood types to provide to parrots – and it’s totally safe for them in raw form. 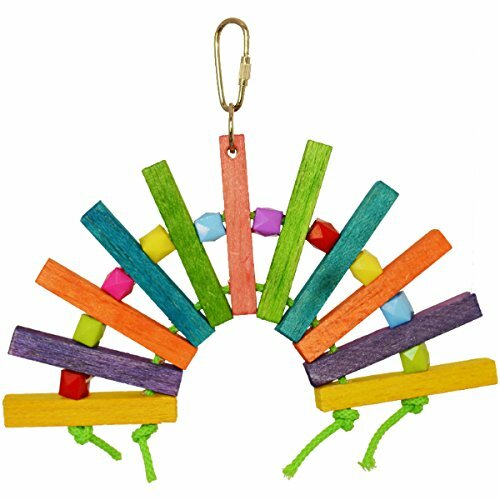 As long as the balsa hasn’t been coated or treated in any way, besides in bird-safe dye specifically for bird toys, then raw balsa is safe for parrots to chew on. This is a very soft and light wood – so light that it almost feels like you’re holding styrofoam. Larger beaks can make easy work of it very quickly. But they get a lot of enjoyment out of doing it. Balsa wood is widely sold as a craft product as it’s used for modelling and other things. With so many places selling balsa, it’s impossible to know if every product is safe when it’s being sold for craft or other recreational uses. Some might have chemicals, bleaches, paints or other coatings applied to the wood. So the the only two ways one should buy balsa wood for parrots is, as stated above, in completely raw form or when it’s used as part of a safe bird toy. You can buy off cuts and scrap pieces, which are usually not smooth and sanded like this one. These often make suitable pieces of Balsa for birds. You can either just give them big blocks to shred, cut into foot toys, or use it as an “ingredient” in your own home made bird toys. Whenever buying balsa (or any other type of wood), be 100% certain it has not been treated with chemicals, coatings or other toxic products. 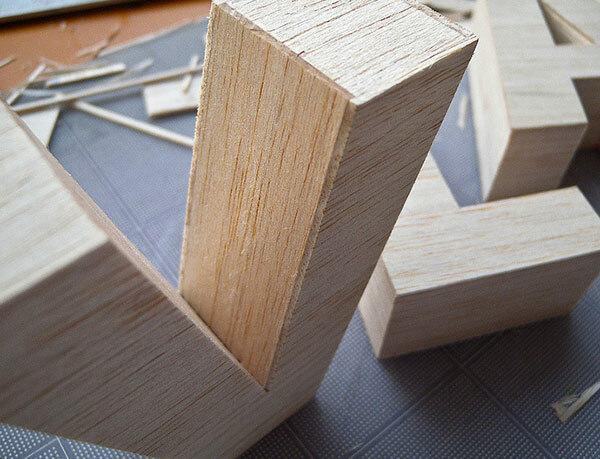 Balsa pieces are best cut with a sharp hobby knife, rather than with a saw. It’s not only easier with a knife but cutting this wood with a saw can generate lots of fine sawdust. You might be able to find raw balsa in sizes that are parrot foot-friendly, otherwise you can cut your own sizes and shapes. Are Dogwood (Cornus) trees ok to give to parrots as perches and to use for toys and enrichment? The trees in the genus Cornus are most commonly known as Dogwoods. 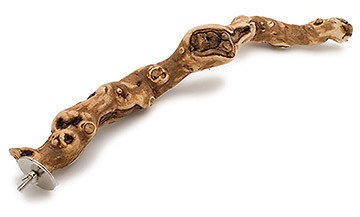 The wood from Dogwood trees is safe to use for parrots, whether it be for perches, toys, or any type of enrichment. The wood of Dogwood trees is considered very hard, so is a great choice for large parrots like cockatoos and macaws who can make light work of softer woods. 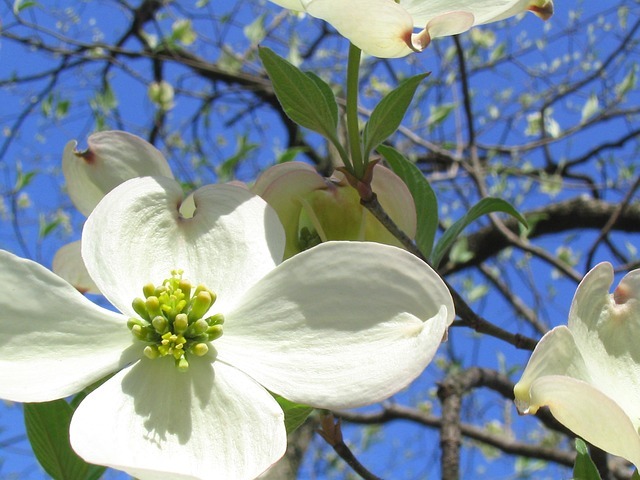 As with all trees and plants – only use Dogwood branches and foliage that have not been sprayed with chemicals, and are not located near busy roadways or in industrial or other high pollution areas. Because Dogwood trees are often used as ornamental and landscape plants, they are often found in locations that aren’t always safe or suitable for harvesting for parrots – due to pollution and other hazards. But if you can find a healthy stand of Dogwoods then you’re in luck as they’re a wonderful treat for parrots. The fruits of Dogwood trees are a favorite for wild birds, and captive parrots can enjoy them too. They are believed to have a fairly high fat content though, which is why they’re so relished by songbirds who have to migrate. The songbirds are able to put on significant amounts of fat very quickly, which they need to survive their long migrations. For parrots in captivity, fat gain isn’t something to encourage. So Dogwood berries (or fruits, whichever you like to call them), are something that can be enjoyed in moderation, but not to excess. Growing your own is an option too, of course. If you live in a cooler climate then Dogwood trees may grow well for you. They can be grown as a shrub or small tree depending upon the species, and some are sold specifically as edible with the fruit (or drupes) having a particularly sweet flavor in some species, like Cornus kousa. Another type of Dogwood sold for its edible fruits is Cornus mas. If you want to try growing your own Dogwood trees for your birds, then picking a partially shaded spot is a good place to start. Too much sun on these plants can bring about heat stress and borers, reducing the health of the plant or killing it completely. Dogwoods need well drained soil, but must be watered regularly throughout summer so the soil doesn’t dry out. Some Dogwoods, like the flowering dogwood (Cornus florida) contain a sap that is bled if the plants are pruned during winter. If you want to remove any branches, doing so in summer time means that you can avoid this sap coming out of the tree. Once a new Dogwood plant has become established with good care, they are a hardy and low maintenance plant and one that has many benefits for your parrots. The Douglas-fir tree (Pseudotsuga menziesii) is a conifer that is native to the Pacific northwest United States. This tree can grow to massive heights in the wild. It’s a fast growing tree with useful and valuable wood, so it is a species that’s often used in timber plantations not only in the US but in other countries as well. Note that the Douglas-fir is not a real Fir tree, despite its common name. A good example of why scientific names are important. Using Douglas fir tree branches for perches and toys is safe for parrots. However as always, the wood should be untreated and not been sprayed with any pesticides or chemicals nor located in an area where pollutants or toxins could have infiltrated the tree. The golden rule always applies: if in doubt, don’t. Some commercially produced natural wood parrot perches are made of Douglas fir wood. Douglas fir wood is technically classed as a softwood, but has a hardness rating on the Janka hardness scale of 2,900 N. As a comparison, Balsa wood has a Janka rating of 440 N, while Teak wood has a Janka rating of 5,140 N. The hardest wood species are rated at over 20,000 N on the Janka hardness scale. Douglas fir trees are often grown for Christmas trees. These trees are often heavily sprayed with chemicals so that insects are not brought into homes when the trees are harvested at Christmas. Christmas tree Douglas-fir (or any other species) are not safe for parrots – unless you can be 100% sure they have never been exposed to chemicals. This classic evergreen conifer tree has attractive pine cones which make fun enrichment and foraging toys for parrots. Some stores, like craft and decoration stores, sell pine cones. But again these are often coated and are dangerous for parrots. Coatings can include various lacquers or paints, weather resistant substances, and even fire retardant chemicals. In short, stay away from decorative and any pine cones sold in stores. How old are the pine cones? The older they are, the higher chance they could be contaminated from weather, mold, wild animals and so on. Have they been on the ground long enough for moisture and dampness to have caused fungus to have grown (note that this doesn’t take long)? If so, leave them. Weather conditions will play a role in this. Damp areas with high and regular rainfall are higher risk for taking anything from the ground to give to parrots. What’s the environment like? As with any tree or plant, pine cones shouldn’t be taken from spots that have storm water run-off, in industrial areas, near busy roads, or anywhere that chemicals or pollutants could directly or indirectly make their way on to the tree itself or on the ground where the fallen pine cones are. Remember that small insects can make their home in theses cones, such as spiders and beetles. Some people recommend putting pine cones in the oven for up to an hour at 200F or about 95C to kill of molds, fungus etc (note this will not remove chemicals or pesticides) and to completely dry them out. Other people believe this is overkill and unnecessary. It is up to you to decide what you are comfortable with. 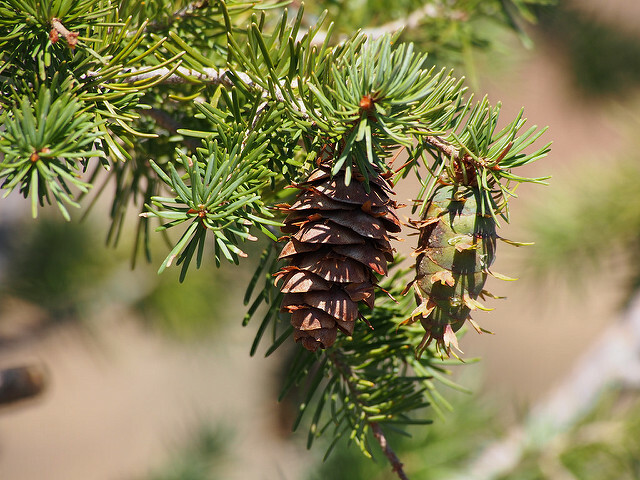 The important thing is to feel confident that your source of Douglas fir pine cones are clean and safe to start with – and the best way to do that is to have a location that you can regularly check, and collect the cones as soon as you can after they’ve dropped; if you’re unable to reach to remove them directly from the tree first. If you have the space and live in a suitable climate, you can always start growing your very own Douglas fir trees from the seed that you collect from pine cones. This site has a great guide on how to do just that. Driftwood is simply wood that has been washed up on to the shore – either from the ocean, a river, lake or other water body. Any type of wood can end up as driftwood, whether it has come from a natural area, a ship, or a human structure on land. The tides and elements break up and weather the wood, until it ends up washing to shore in any size ranging from small branches and pieces, to entire trunks and large limbs. 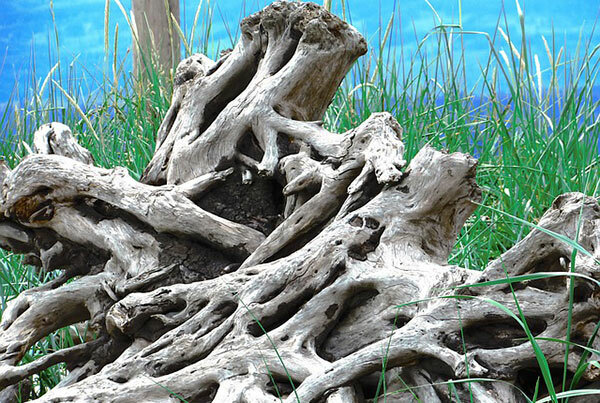 Driftwood is popular amongst aquarium enthusiasts as well as by people who just want some rustic looking wood to decorate their garden. But driftwood is not suitable for parrots. Taking driftwood from where it’s washed up into your home means yo bring home more than the wood – more often than not there will be minuscule, and sometimes much larger, marine creatures like marine invertebrates. Fungus, mold and dirt can also be present, and the condition of the wood and what might be found on it (either visible or not) not only depends on how long it’s been in the water and the type of water, but how long it’s been washed up for. As the wood is normally old, it is also often affected by rot which is what gives driftwood its rustic look. If the water itself where the driftwood has come from is contaminated, such as many rivers and lakes, this presents a whole other risk. Clearly, driftwood is not something that a parrot needs and the risks are great. Yes, driftwood can be cleaned however when the rotting and breakdown process has begun, the wood becomes more porous and can be almost impossible to clean properly and remove all traces of contaminants. 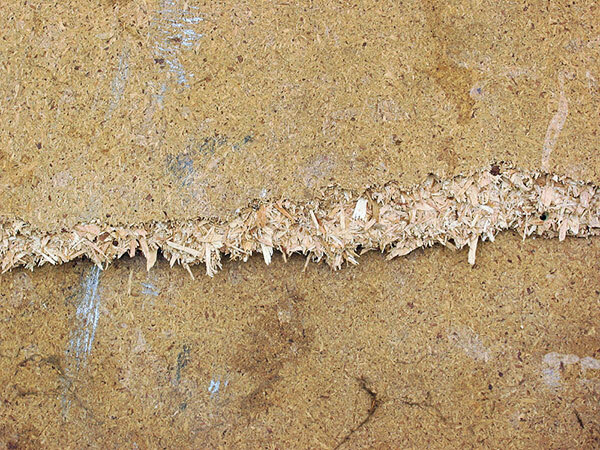 Cleaning driftwood properly can be a long and slow process. In addition, there is no way to even know what type of wood it is, where it’s come from, what contaminants it’s come into contact with, and so on. Driftwood is a mystery box of uncertainty; and that’s not compatible with parrot health and safety. With so many safe, useful woods available for parrots, it is difficult to consider driftwood as an option when there are many risks involved. There are too many unknowns with driftwood and thus – a very high risk. Driftwood should be avoided. Instead, use safe, reliable, healthy woods for parrot perches, toys and all other purposes. MDF (medium density fibreboard), also called particleboard, is a low cost wood sheet product that parrot owners might often consider using for purposes such as a base for play stands. MDF is made up of bonded wood fibers, and these can be different across different products. 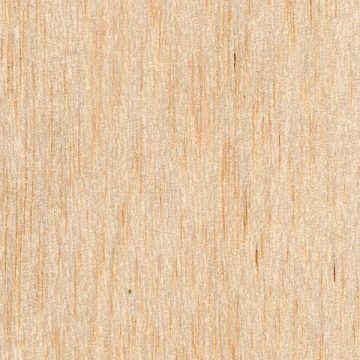 Most MDF is made up of fibers from softwood trees, but higher quality and more expensive MDF might also use hardwood fibers. Plantation pine is often used as well as various types of wood scraps. As well as the tiny wood particles, it’s the binder or adhesives used to bond the fibres together that come under questions of safety for parrots (and for humans too). Since parrots are likely to bite and chew into MDF boards, it’s important to know whether this poses a risk. Many pre-made parrot and bird nesting boxes are made from MDF. Whether this is ideal is questionable and everyone will make their own decision about the safety of using an MDF based box versus one made of solid hard wood, natural logs or other materials. Small parrots like budgerigars are unlikely to tear about their nestbox, instead being more concerned about what they’re doing inside the box. Cockatoos on the other hand would certainly not be suited to MDF or other non-hard woods. Formaldehyde is the culprit in many MDF products which causes the most concern for human health as it can emit toxic gases into the air. More and more, formaldehyde-free fibreboard or MDF is available as people learned more about the risks of formaldehyde (these in fact can still contain tiny amounts of formaldehyde naturally found in the wood itself, but not in the adhesive). You’ll now likely to be able to find clearly labelled formaldehyde-free MDF products, since it has become a positive selling point. If it’s not labelled as formaldehyde-free, then there’s a good chance it’s not. If in doubt, ask. The risks of formaldehyde in MDF or particle boards to humans are listed as eye, nose and throat irritation, skin dermatitis, and effects on the respiratory system. More serious are the potential increased risk of cancers and possibly reproductive complications. It’s not just the adhesive itself that’s a risk though. Cutting into MDF boards can bring about problems – sawing or cutting particle board creates a very fine powdery dust which is then breathed in, as well as settled on skin, clothing, furniture etc. A parrot biting or chewing into particle board has the same obvious effect. Allowing a parrot to chew into, scratch or even otherwise tamper with MDF boards, certainly when they contain formaldehyde, should be absolutely avoided. It’s not just the resins or adhesives that pose a risk – but the tiny wood dust fibres that make up the MDF itself which can lodge into the sensitive respiratory system of parrots (and humans). Speak to your vet with specific concerns regarding the use of MDF with your birds. Many vets do outright say that birds should never be allowed to chew on MDF. The Granadilla fruit (Passiflora ligularis), also called Sweet Granadilla or Passionfruit (not to be confused with the more common passionfruit Passiflora edulis), is thought by many to be the best tasting passionfruit available (by people; but the birds might agree!). The fruit is an orange/yellow color, while the more familiar passionfruit (depending where you live) is a dark purple color. 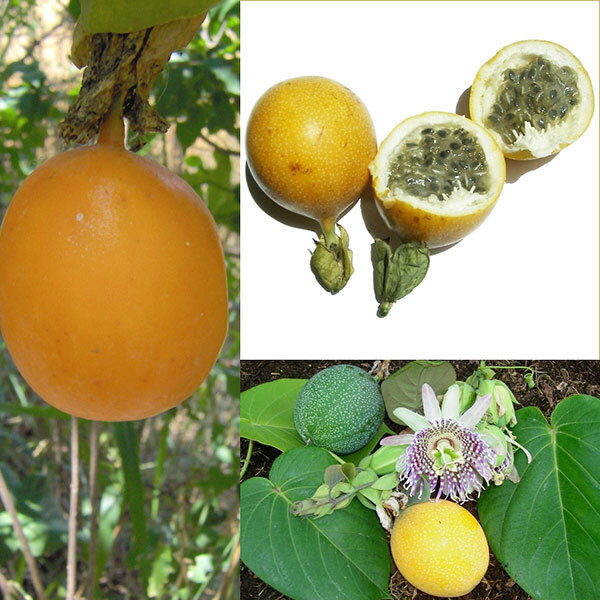 There is also the largest passionfruit: the Giant Granadilla (Passiflora quadrangularis). This passionfruit actually resembles a melon more than the familiar passionfruit, and it has a fleshy white layer inside which is edible and sweet tasting, as is the deliciuos inner pulp which is filled with edible seeds. The pulp is nutritious, containing vitamins A, C, and K as well as phosphorus, calcium and iron. The Granadilla is a wonderful tropical fruit that many birds will enjoy, if you’re fortunate enough to live in a climate where you can either grow them yourself, or find them locally to buy. Any vegetable that is safe for a parrot to eat fresh, is also obviously safe to eat when it’s been frozen and thawed. Not all vegetables are suited for freezing, as they can come out mushy when thawed and can be unpalatable or just a lot less appealing to birds (and to humans). Every bird is different. Some like raw vegetables, some like them whole, others like them cut in chunks, or blended into a chop style. A light steaming keeps vegetables crunchy, and this is another preference for some birds (and a good way to keep in the nutrients). The real question is, are frozen vegetables as nutritious and tasty as fresh veggies? It comes down to how fresh the vegetables were when they were frozen. 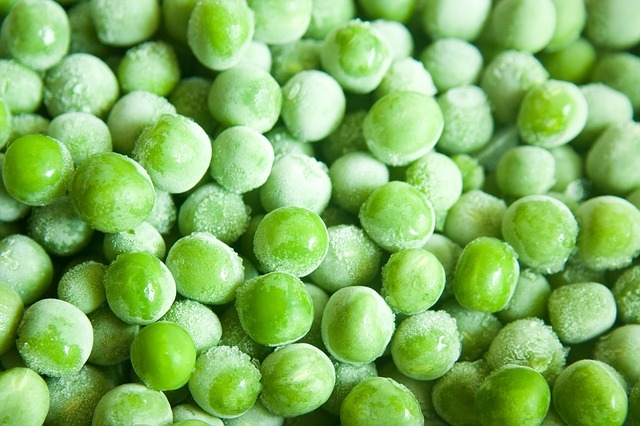 If you’re buying frozen veg from the supermarket, they’re usually “snap frozen” – in other words, frozen very soon after being harvested. On the other hand, vegetables (and fruit) sold in stores can often be not as fresh as you might think. Some may have been put in frozen storage for weeks, then thawed out for sale. These are nowhere near as fresh as what you’d get if you grow your own, buy from farmer’s markets, or buy pre-frozen veegetables. Experts say that the important nutrients like fiber and vitamins remain in snap frozen vegetables, but are often lost if you buy fresh produce that isn’t really fresh. Cherries are safe for parrots. Along with apple, peaches, plums, pears and apricot fruits (amongst others), cherries also have pits or seeds that contain small levels of cyanide. The scientists at Sciencenotes.org state that “chewing the seeds makes them much more hazardous” and that”it takes around 1 milligram of cyanide per kilogram of body weight to kill a person”. While there isn’t specific data about birds, it goes without saying that the potential risk is high – especially if a bird is given a large bunch of whole cherries to eat. Removing cherry pits is simple and absolutely advised. It provides peace of mind and removes the risk. This means the best way to give cherries to captive birds is to simply cut them in half and remove the pit. 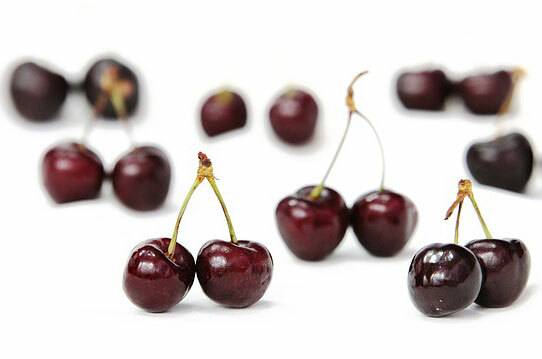 Cherries that are not organic are one of the worst foods for having high pesticide residue levels. In fact the Environmental Working Group rates cherries as number 7 on their Dirty Dozen 2016 list. This means that from their testing, cherries contained the highest level of pesticides after only 6 other foods (all of which parrots also love to eat). This is concerning and provides huge incentive to buy organic wherever possible, or to grow your own. Cherries comes from various trees in the Prunus genus, but most commonly the fruits are from different types (cultivars) of Prunus avium. The Prunus genus of plants also contains other well known fruits like peaches, nectarines, plums, apricots and almonds. As stated the pits of cherry fruits contain toxic cyanogenic glycosides which can be very poisonous at high levels. But many people aren’t aware that the entire plant also contains these compounds. So the leaves and stems of cherry trees, as well as the fruit pits/seeds, also contain cyanide. All Prunus plants, which includes cherry, are listed as toxic to dogs, cats and horses by the ASPCA. No types of Cherry trees, either cultivated or wild, or any other plant in theb Prunus genus should ever be provided to parrots. Cherry tree branches should never be used for perches, toys or any other purpose. Cherry trees are toxic to parrots. Cherry fruits are safe for parrots and removing the pits is highly advisable. Cauliflower is very rich in Vitamin C, and also contains high amounts of Vitamin B6. Potassium and dietary fiber also feature strongly in cauliflower. This is an important and common vegetable that is easy to include in the diet of captive parrots – whether as a whole food or chopped up into a mix or chop style combo. Yes, cauliflower leaves are edible for parrots and people. Like so many vegetables, people have become so used to only eating a certain part and throwing the rest away. This is so often a waste of nutrition and a huge waste of food! These forgotten food parts can easily double the amount of food you have on hand to feed your birds and to add to their mixes, or just use as snacks – as well as cut down on waste. It goes without saying that not all plant leaves can be eaten – tomatoes for example have toxic leaves – but cauliflower and broccoli leaves are edible as are many others. Always check for safety before feeding any vegetable or fruit greens to parrots. Many people eat cauliflower leaves cooked. Parrots can enjoy them raw, as their toughness will likely be welcomed by birds. Cauliflower leaves are nutritious; containing vitamins A and C as well as being a good source of fibre and antioxidants. If your cauliflower isn’t organic or grown in your own garden, the leaves need to be washed as thoroughly as you would wash every other vegetable. Either raw or lightly steamed cauliflower is safe and nutritious for parrots. Many vegetables are believed (and often proven) to be healthier raw, while others have shown to be healthier when cooked – usually lightly steamed so as to keep certain nutrients and compounds at their maximum level. Cauliflower is in the Brassicaceae family of plants, along with broccoli, kale, collard greens and other familiar vegetables. This family of vegetables is said to be healthier when eaten raw as important substances are lost when cooking them. That doesn’t mean that cauliflower and its relatives are unhealthy cooked – many birds prefer cooked foods and they are certainly still nutritious (just don’t over-cook). And as experienced parrot owners will agree: it’s best to provide healthy veggies to parrots in the format they prefer rather than having them turn their beaks up and being completely uninterested in vital health foods! Cauliflower can be grown in a backyard vegetable patch from seed. Growing from seed is always the lowest cost option. It’s also the slowest and can be less reliable if you are inexperienced. But it’s also hugely satisfying to see your garden grow starting from nothing but seeds! Alternatively, if you want a head start then you can pick up seedlings or more mature cauliflower plants. Cauliflower grows the best in locations that are cooler and more mild, without dry hot summers. 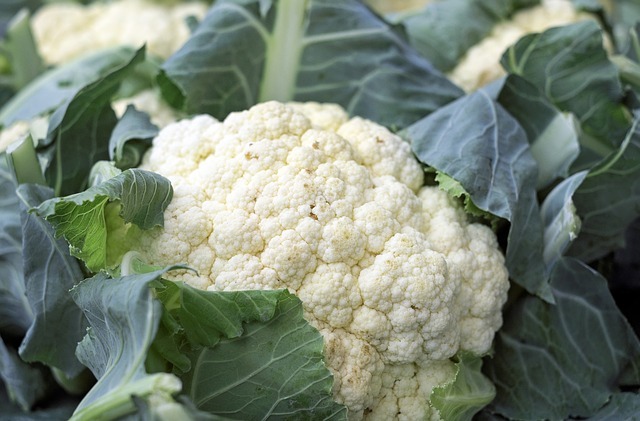 That doesn’t mean that you can’t try and grow cauliflower if you live in a hotter and drier place – it can just require a little more work to make sure they don’t become dry and that you plant them in a shaded spot rather than in a place where they’ll get the full brunt of a harsh sun. One of the more controversial foods to feed birds is asparagus. Many people wonder if Asparagus safe or toxic for parrots to eat. There’s some misinformation and confusion out there surrounding this food. 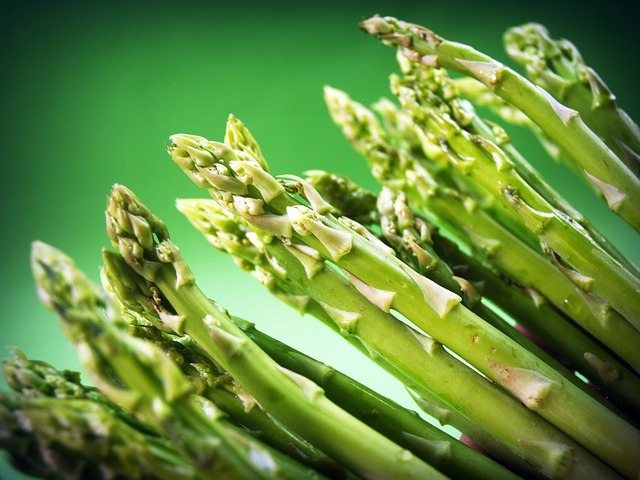 The Asparagus food that we are familiar with is just one of about 300 plants in the Asparagus genus. This vegetable is Asparagus officinalis. That’s the one that is the focus of this article, as many people wonder if it’s safe or toxic for parrots to eat. There’s a bit of misinformation and confusion out there surrounding this particular food. 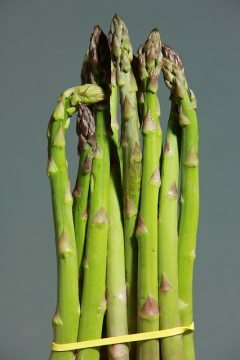 The asparagus vegetable itself consists of the shoots of the plant – and only the young shoots. That’s what you’ll see sold in stores and what you think of when you think of asparagus. The reason that asparagus is often listed as toxic or thought of as toxic to parrots, is because as the plant matures it develops bright red berries (the fruit) that are poisonous to humans. Other asparagus species, such as the often weedy Asparagus Fern (several species fit this description), also develop these red berry fruits. Wild birds often eat these berries and that’s how the plant has become a weed in some places. Just because something is toxic to humans, it doesn’t mean it has the same effect on birds or other animals. Despite this, providing asparagus plant berries to parrots in captivity is considered by most to be an unnecessary risk. Simply not enough is known about how or if wild birds have developed a way to offset any potential toxic effect of asparagus berries. So what’s the verdict on giving asparagus to parrots? The asparagus shoots, that is the familiar vegetable that you’ll find in stores and markets, is generally fine to provide to parrots in small quantities or on occasion. These can be fed raw or cooked. There is no conclusive evidence or research that points to asparagus being a danger to parrots. There are anedoctal stories and comments around the web which certainly question whether this food could potentially pose a risk to birds, especially if eaten in large quantities. Is asparagus something that a parrot should eat a lot of? Not likely. We just don’t know enough about it at this stage. But to be on the safe side, whole asparagus plants should not be something that is planted in aviaries or given access to for parrots, due to the risk of toxicity in the fruiting berries. Nutmeg is used as a spice in a wide variety of international cooking. But is it safe or good for parrots to eat nutmeg? Nutmeg is known to be highly toxic to dogs, causing neurotoxicity. Nutmeg contains psychoactive substances that, in large doses, can cause poisoning and psychoactive and hallucinogenic effects in people, due to the presence of myristicin in nutmeg. Whole nutmeg nuts and nutmeg spices are considered a risky food for parrots, with no reason to provide them with this food. The potential health risks make this is a food that is not suitable for birds to consume. Nutmeg is a food to be avoided. With so many safe, healthy foods that can parrot can enjoy without risks, nutmeg can be conveniently and confidently left off the list! Fennel is in the same plant family as carrots (Apiaceae). Fennel is considered a safe plant and a safe food for parrots. It has celery-like stalks and a large bulb at the base. The entire vegetable is edible. 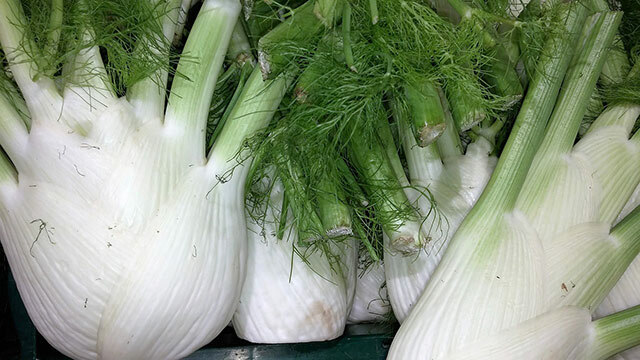 Fennel is a fiber rich vegetable, and contains Vitamin A, Vitamin C, manganese and iron. However, fennel is a vegetable that is generally used by people for flavoring, rather than eaten in large quantities. This is a food that parrots might enjoy in moderation, but like many other foods, is not one that is considered to be a central or staple part of the diet. The stems of fennel can even be just a fun enrichment or treat for parrots, or even the entire vegetable (bulb plus stems). Fennel vegetable can be given to parrots raw or cooked. But raw fennel provides much enrichment for birds thanks to the crunchy texture. Keep in mind that some plants in the Apiaceae family are toxic, so always make sure you can identify a fennel plant 100% before allowing a bird to access it; fennel vegetable bought from stores and food markets is of course easily identified. Wild fennel has become a weed in some places, and is often seen growing by roadsides, in pastures and along river banks. The plant has a scent that is similar to aniseed. Wild fennel is different from the cultivated type of fennel that you find in stores and markets because it does not have the familar large edible bulb, but instead it has greens which are more flavoursome than cultivated fennel. Like all vegetables and plants – organic is best for parrots. Any non-organic fennel must be washed thoroughly. What about growing fennel yourself? You can grow your own organic fennel from seeds. It’s best grown in a spot that gets full sunlight and in well drained soil. It’s a fast growing herb and only takes around 90 days (sometimes less) until you’ll have fennel vegetables to harvest from your own garden. If you want to harvest the bulb of fennel, this has to be done before the plant goes to seed (keep in mind that the seeds spread easily, hence why fennel has become a thick growing weed in some places). If the weather is too dry or your fennel plants aren’t being well watered, the bulb will dry out and thsi is when the fennel plant will go to seed. That’s why it’s important to water fennel plants well when the bulb is forming, and harveset the bulb when it’s ready, because the bulb loses condition once the plant goes to seed. While watering is important, the well drained soil that fennel prefers is vital because allowing the soil to become waterlogged increases the chances of root rot forming which can damage and destroy the plants. 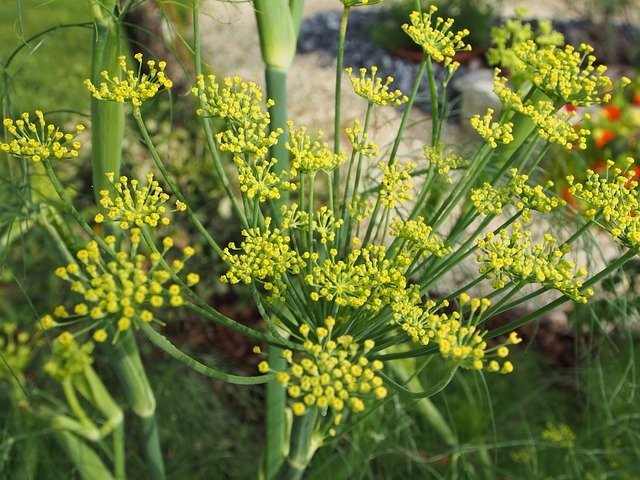 There’s no need to grow fennel in a container; in fact it does best being sowed straight into a garden bed as it doesn’t transfer well from a container. Because fennel plants can cross pollinate with other closely related herbs like dill and coriander, fennel should be grown away from these plants if you also have them growing in your herb garden. These are all common names for the plant Pachyrhizus erosus. When asking if the Jicama plant is safe for parrots, you’ll most likely be referring to the edible tuber. The plant itself is a vine. but it’s always good (and important) to know whether any or all parts of a plant are fine for parrots to have access to; just in case you have one growing. 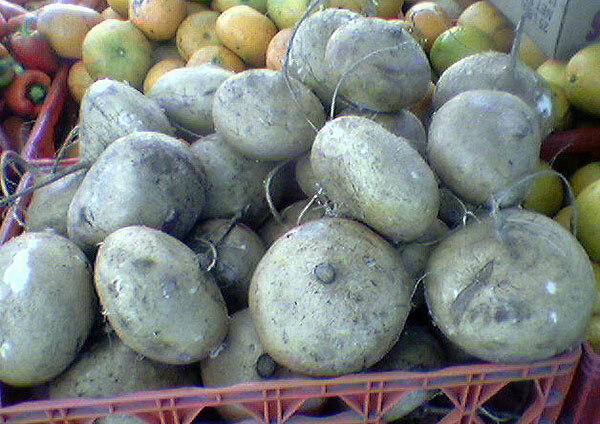 Parrots should not be given access to any part of a Jicama plant as it is toxic. In terms of edibility of the Jicama tuber itself, that will be the main point of discussion here. It’s a vegetable that is not particularly well known, but something that people often seek out at farmer’s markets and health food stores. Jicama has gained a following thanks to its potential health benefits for people. The fact that the Jicama vegetable is high in starch makes it a food that wouldn’t be something that a parrot should be eating a lot of. Think of it as similar to white potatoes. Unlike the tuber which is safe, the rest of the Jicama plant is toxic – including the vine, leaves, flowers and seeds/seed pods. This is because of the compound rotenone that is found in the plant. This compound is actually used as a powerful insectcide and pesticide. It is something that the plant produces naturally to protect itself from insects. So birds should certainly not have access to any above ground part of a Jicama plant. If you’re fortunate enough to live in a warm tropical climate where you can grow Jicama yourself (they need around 9 months minimum of frost-free conditions if the tuber is to develop to a good size), make sure it’s not planted in or near an aviary, enclosure or anywhere else your parrots could reach. The plant will also grow in locations that have at least 5 months of frost-free weather, but you’ll get smaller tubers. You might have seen Jicama chips available. These crunchy (and rather expensive) snacks are tasty – for people. This processed food usually has salt and sometimes sugar added to it. Needless to say, like all crisps and packaged foods, Jicama chips aren’t healthy for parrots to eat. If eggplants are given to parrots, the skin must be removed. 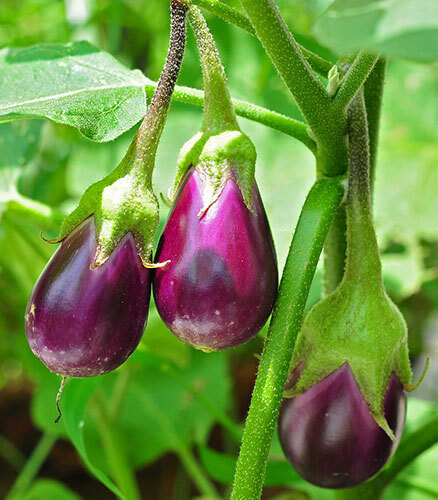 Eggplant plants are toxic besides the inner flesh of the fruit. Eggplant is one of those foods with no black and white answer when it comes to safety and suitability for parrots. Another name for eggplant is aubergine. Generally eggplant is not something that people feed to parrots, because there are too many questions and unknowns about potential negative effects. And although somewhat nutritional, it’s not high up the list of healthiest foods so most people have little reason to include this as part of a bird’s diet. Eggplant is a plant (Solanum melongena) in the Solanaceae (Nightshade) family. 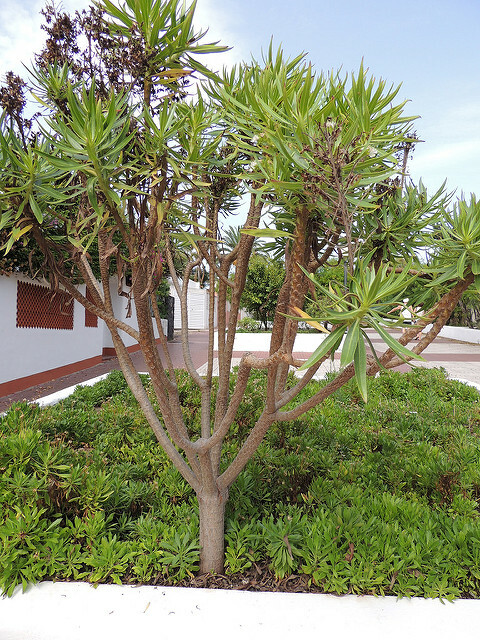 This family includes a lot of plants that have toxic foliage or other parts. Eggplant is in the genus Solanum which also includes tomatoes and potatoes. As is widely known, the foliage of tomato plants is toxic. However just because eggplants are part of the Nightshade family, it clearly doesn’t make them toxic. The eggplant itself, which is the fruit of the tree, is cultivated and enjoyed by people around the world. Are they suitable for parrots though? Those who give their birds eggplant (or aubergine) make a note that they only feed the inside (known as the meat) while removing the skin. This is the most advisable method. Other parrot owners however, put eggplant in the uncertain basket, and simply prefer not to feed foods where there is little to no data about both the benefits and the risks. In all reality, a small amount of eggplant flesh is not going to harm parrots. It is not common that you’ll find a parrot owner who feeds this food as a regular part of the diet though. The seeds inside the eggplant contain some nicotinoid alkaloids, which give them a bitter taste. These are similar alkaloids that are found in tobacco plants, which are also in the Nightshade (Solanaceae) family. The entire plant – leaves, flowers and stems, of the eggplant plant itself are considered toxic and parrots should not have access to these plants. So if you are growing eggplant at home, parrots should be kept away from them. The skin of the eggplant fruit should be considered toxic as well. Eggplants also contain high levels of oxalates, which in itself is not a cause for concern when a parrot has a balanced diet, but is simply another thing to be aware of. Of all the greens available to feed parrots, lettuce is far from near the top of most nutritious. Other greens, such as Asian greens (bok choy etc), dandelion, and many others are considerably more valuable and healthy. The darker green the vegetable is, the more nutritious it generally is. Many lettuces are light in color, indicating their high water content. However even the darker coloured lettuces do not have the nutrition values of the more important greens that are part of a parrot’s daily diet. 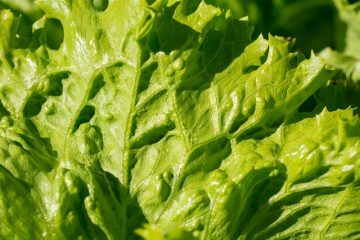 Most lettuce types are made up of over 95% water. If birds eat too much lettuce the droppings become noticeably more watery. Lettuce is not something to include as a regular part of a parrot’s diet. The consensus is out though. Greens other than lettuce are far more beneficial for parrots. Collards, kale, Asian greens, and many others provide huge choice and benefits for birds. Most lettuce types contain Vitamin A and antioxidants. Iceberg or crisphead lettuce is the lightest color, and the least nutritious overall. Despite this, lettuce of any variety is not considered a recommended food for parrots. Lettuce simply doesn’t contain the exceptionally high nutrient values of other types of leafy green vegetables like kale, collards, broccoli leaves and dandelion. So is lettuce ok for birds to eat? While lettuce certainly isn’t toxic for birds, its low nutritional value when compared with green leafy vegetables, and its high water content, makes it a food that is not required or beneficial for parrots as a regular part of their diet. Also to keep in mind is that lettuce is another food that is farmed with high levels of pesticides unless you buy organic or grow your own. Are sultanas and raisins good, bad or toxic for parrots? 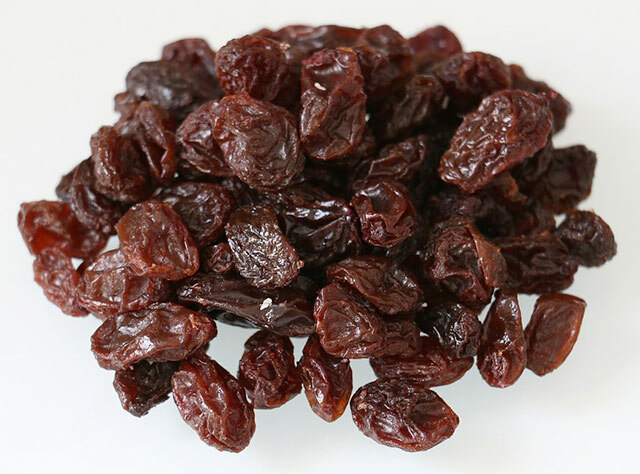 Raisins and sultanas are dried grapes. The difference between the two is the type of grapes used. Many people use the words raisin and sultana interchangeably though, and when it comes to wondering whether it’s safe or good to give these foods to parrots, it makes little difference to separate sultanas and raisins. They can both be thought of together (as can another dried grape, known as currants). Fresh grapes are considered a high sugar food and one that is provided only sparingly to parrots. Just like grapes, raisins and sultanas also have very high natural sugar levels (almost 30% each of fructose and glucose). Dried fruit, additionally, often has sugar added to it. This increases the sugar content even more. however, even dried fruit like raisins and sultanas that don’t have added sugar still have a high concentration of natural sugars. Packaged raisins can also have other things added to them, like salt and other preservatives. In any case, this is definitely not a healthy recipe for a bird’s diet. So when asking whether raisins are ok for parrots, think of the health benefits versus the potential risks and downsides. The high sugar content and added preservatives in raisins and sultanas makes them not a food that is considered healthy for birds to eat. With so many other healthy foods to choose from for both the regular diet and as treats, there is very little reason to feed raisins, sultanas or any dried fruits to parrots, with the negatives far outweighing the positives. Plants in the Dracaena genus are very popular indoor house plants. Some, like Dracaena draco, are attractive outdoor garden trees. If you’ve got parrots inside and they have access to any indoor plants, you’ll want to be 100% sure that they are not toxic or dangerous to birds in any way. Even if you don’t intend to give your birds a house plant, their curiosity only take a second to kick in and while rare, some plants are toxic enough that you won’t want your parrots anywhere near them. There are over 100 plants in the Dracaena genus of plants, but they aren’t all commonly available. The ASPCA lists all Dracaena plants as toxic to cats and dogs. The reason given for this toxicity is simply “saponins”. Saponins are chemical compounds often found in plants. There are both toxic and beneficial types of saponins. Dracaena species have been scientifically studied for their saponins, with anti-inflammatory steroidal saponins being found in one species. 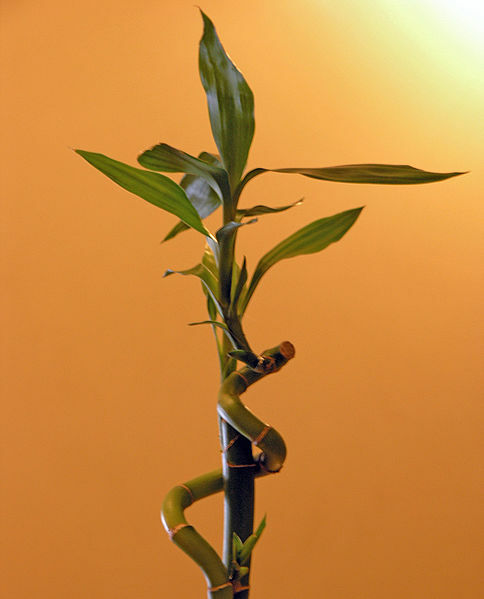 Most “safe and toxic plants for parrots” lists out there have Dracaena on the safe list. Whether these have just been copied from one site to another is unknown, but it’s extremely unlikely that each list has been thoroughly researched on an individual plant species or genus basis. Instead, hearsay can often play a big part in such lists. The fact that Dracaena is listed as a toxic plant for pet mammals should raise some concern and questions. Certainly there are many plants which are toxic to mammals, but which birds can handle without any issues. But if there is no evidence, research or scientific data out there, assuming something is safe just because it exists on a list on one or more websites, is risky business. This article will be updated if any data is found about Dracaena and its potential effects on parrots. Bird owners should use their discretion when considering the potential risks vs rewards of allowing access to a plant like Dracaena species, when no real information exists as to its safety or potential danger for birds. Are mushrooms toxic to parrots? Mushrooms present a whole lot of risks to birds and many are fatal even to humans. There are thousands of types of mushrooms throughout the world. The small number that humans eat are safe for us, but many mushrooms (such as the aptly named Death Cap mushroom) are extremely toxic and lethal. Picking mushrooms from the wild and eating them is hazardous and of extreme risk to all but the most confident and experienced mushroom experts. Taking mushrooms from wild places for your parrots (or you) to eat is an absolute no-no under all circumstances. But what about the mushrooms that you buy at the supermarket or fruit store? Are these OK for parrots to eat? 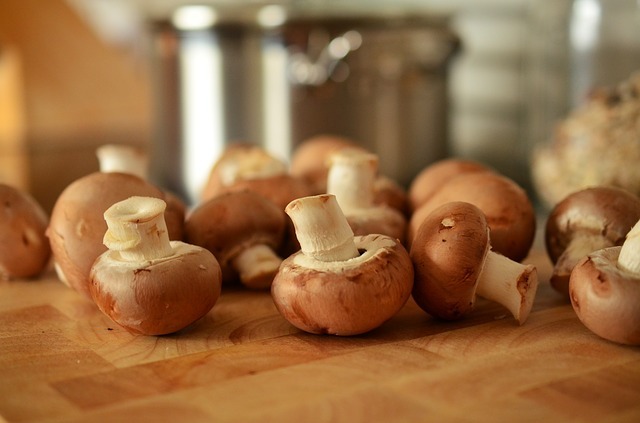 Mushrooms are one of those foods which a minority of people claim they have allowed their birds to eat at times with no noticeable ill effect. However the majority and widespread opinion is that mushrooms are not considered safe for parrots, with the unknown potential risks being too high to ever include this food in the diet, or even as a once off snack. Why take the risk is the logical response to a food with question marks surrounding it, as mushrooms certainly have many of them. If you have an aviary with natural ground including vegetation, it’s not out of the ordinary that occasional fungus might pop up under damp conditions. These should be immediately removed completely from the soil (use gloves and a bag if you aren’t confident in identification). Unless you’re a fungus expert, you’re unlikely to be unable to identify the species of fungus/mushroom and in any case, the safest action is simply to remove it completely before the spores can spread and before your birds can get to it. While fungus can be an important part of soil health, having fresh soil in an aviary can present some hazards to parrots including but not limited to fungal risks. Using river sand or other substrate is advised for this reason. Jade plant usually refers to the species Crassula ovata. It’s a popular house plant, no doubt partly because of its beautiful flowers and attractive shiny green leaves. It’s also small, easy to grow and just a low maintenance container plant that thrives indoors. This is actually a succulent and can be grown in bonsai style – another reason why it’s such a popular indoor plant choice. But are Jade plants safe for parrots and should you be worried if your bird gets access to this plant in your home? 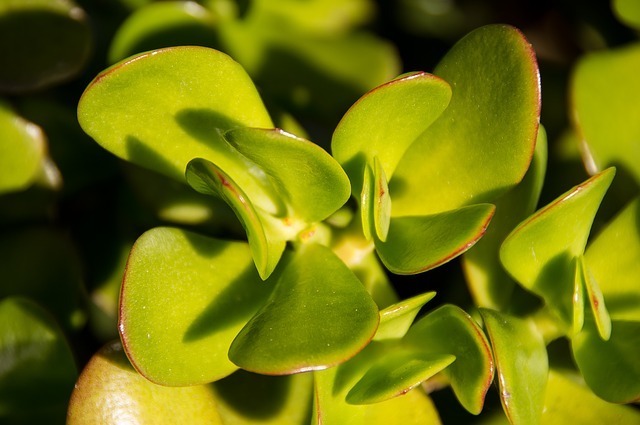 A similar plant closely related to the Jade Plant is Crassula argentea (also confusingly commonly called a Jade plant, amongst other names) is listed as being (mildly) toxic to dogs and cats, with symptoms of skin irritation, vomiting and depression. Although toxicity to birds is often not known for specific plants (and just because a plant is toxic to some mammals, it doesn’t neccessarily mean it is to birds), if information is lacking then erring on the side of caution is the way to go. What we know is: Crassula ovata and Crassula argentea can be toxic to cats and dogs, while their potential risk to birds is unknown. 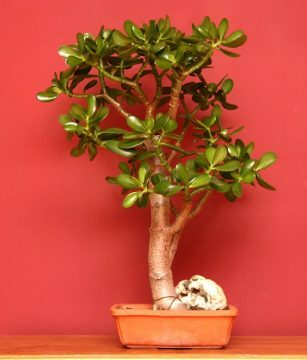 Therefore it is best to just keep parrots away from the plants in this genus (Crassula) – aka Jade plants. This isn’t a plant to have growing in an aviary, and is one that you’ll want to keep parrots away in the home from if for no other reason than “it’s better to be safe than sorry”. Grapevine wood is frequently listed on bird-safe lists. There is nothing out there to indicate that grapevine wood is dangerous for birds to have as perches or toys. The big thing to keep in mind is pesticides. Grapevines are heavily sprayed by most farmers, unless they are certified organic. Wood and any plant parts should never be taken from grapevines that have been sprayed or even suspected to have been sprayed. 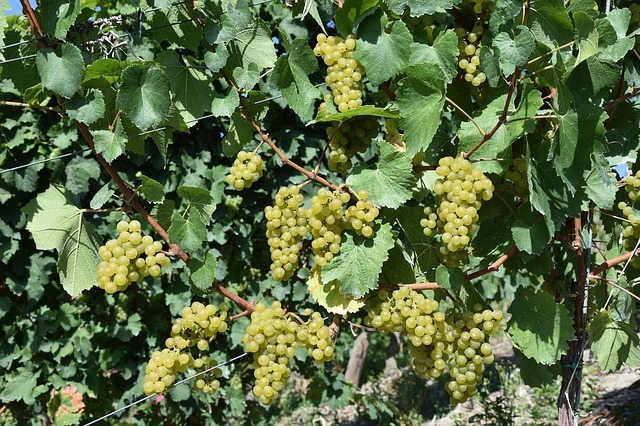 This applies to both grapevines that are grown for consumptions of grapes (known as table grapes) and those grown for wine (wine grapes), which are also usually heavily sprayed with chemicals. It only takes small amounts of pesticides and other toxic chemicals to infiltrate the body of a small parrot, with devastating effects. If you can find a chemical-free source of grapevine wood then it would be welcomed by parrots. In fact, this is one of the few wood types that are used in commercially produced natural perches, like the one from Mac’s who makes pesticide-free grapevine perches that are ready to be attached to cages. Grapes themselves are safe for parrots to eat, but this is a fruit that is high in natural sugars. Most parrots shouldn’t have sugar-rich foods (fruits) as a large proportion of the diet; besides Lorikeets and other specialist nectar eaters. When considering grapes for human consumption, keep in mind that (quote from sfgate.com), “1-cup serving of grapes contains 16 grams of carbohydrate, of which 1 gram is fiber and 15 grams are sugars” (source). Importantly, grapes are another food that are on the list of having some of the highest levels of pesticide residue amognst all fruits and vegetables. That means a lot of pesticides are used in the production of non-organic grapes. Thorough and effective washing of grapes is the best you can do to try and remove as much pesticide residue as possible: or buy or grow organic. 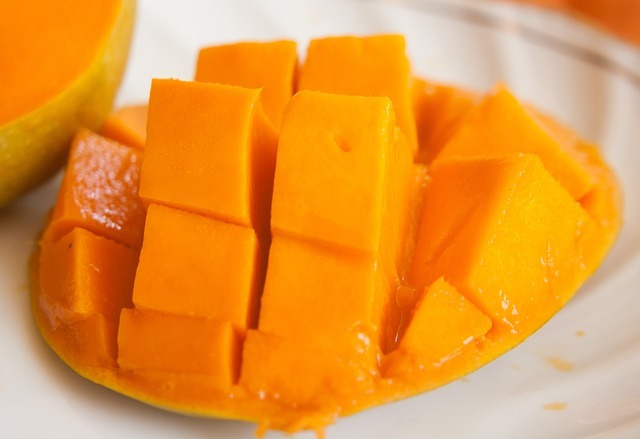 Mangoes have to be one of the best tasting fruits around. And a lot of parrots agree on that as well. If you’re fortunate enough to live somewhere where mangoes can be bought affordably, or even grow your own, then your parrots can reap the benefits of this delicious and juicy tropical fruit. The mango tree is in the same family of plants as poison ivy (Anacardiaceae). The sap of the tree, which comes out at the base of the fruit from the stalk as well as from the branches, trunk and skin of unripe fruit, has been known to cause severe skin reactions in sensitive people. This is due to the compound urushiol, which is found in many parts of plants in the Anacardiaceae family. Mango tree branches and foliage should not be provided to parrots. It is not a suitable tree to use as perches. The only part of a mango tree suitable for parrots is the ripe mango fruit with the skin taken off. Captive parrots can simply enjoy mangoes in exactly the same way as we humans do! Growing your own mango trees is very rewarding! Not only is it exciting to have your own fresh, organic mangoes to pick straight off the tree and into your parrot’s bowls, but mature mango trees are a attractive landscape feature and can provide much needed shade in warm climates. Mangifera indica is the plant most commonly grown for the mangoes that we are familiar with. But there are dozens of different varieties (or cultivars) available, all developed to have different characteristics (such as size, shape, fruiting variations), and to survive in a range of conditions. Traditionally, mango trees are a tropical species where they thrive in wet summers, and dry springs and winters. Besides occasional mild frosts, mango trees are not suited to locations that experience harsh winters. Some cultivars of the Mango plant have been designed to grow in cooler than normal climates, so even if you don’t live in a tropical or sub-tropical zone, your local nursery may very well have a mango plant that has been developed to thrive where you live! Keep in mind that if you have grown your own mangoes or bought them from someone who has not put them through the cleaning process that removes the residual urushiol, which can also be found on the skin of the fruit, you put yourself at risk of coming down with urushiol-induced contact dermatitis which can be an extremely painful allergic condition, and potentially dangerous in severe cases. 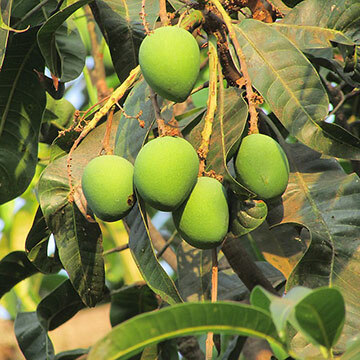 People are often exposed to urushiol, either in mango plants or other plants that contain it, and have no reaction until they have additional exposure to it in future and the rash itself can take sevearl days to develop after you’ve had contact with the irritant. First time reactions can even take up to 20 days or more, which can often leave you confused as to what might have caused the reaction. Whether or not parrots can be affected by urushiol has not been studied but in any case, avoiding all contact with this potential irritant is advisable for your own sake, as well as that of pets. There are lots of types of fig trees – over 800 in fact. Fig trees refer to all the species in the genus Ficus. But only a few of them are really well known and cultivated in gardens and homes. Most people think of the common fig when talking about fig trees: Ficus carica. This is the plant with the familiar fig fruits that people and parrots love. Fig fruits are certainly safe for parrots to eat, although generally not something given on a regular basis besides to birds like fig-parrots and lorikeets. Figs are a high fiber food – and are one of the most common foods recommended for people to eat when constipated. Surprisingly to many people though figs aren’t particularly rich in any vitamins or minerals at any high levels. They certainly have some goodness though, with manganese, calcium, and vitamin B1 amongst those found in figs in relatively small to moderate amounts. Figs can provide much fun and enrichment to parrots though. 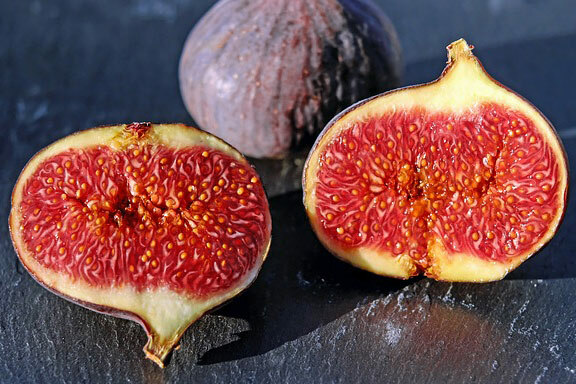 A ripe fig is fleshy and seedy, and most birds will love to tear through it and demolish it (or just play with it). Dried figs or fresh figs for parrots? Like all dried or dehydrated fruit snacks, added sugar is often an ingredient. Feeding captive birds any sort of dried fruit is generally not recommended. Fresh figs are not only healthier and safer, but have the added benefit of acting as an enrichment item as well (if you don’t mind cleaning up the mess), because of the time it takes to get into the fruit and demolish it. This mimics in many ways how parrots spend much of their time in the wild. Birds that are predominantly fruit and/or nectar eaters in the wild gain the most from the occasional fresh fig – lorikeets for example. Fig Parrots, not surprisingly, eat figs (of various species) as a large part of their diet in the wild, as well as other fruit and seeds in the canopy. Fresh figs are enjoyed by many captive parrots as an occasional or in-season treat, rather than a regular part of the diet or an everyday food. Keep in mind, if the figs store bought and not organic, they are likely to be covered in pesticides. You can try and peel the fig, or otherwise do an extremely thorough wash as best as possible. The best solution is of course to grow your own, if possible. Fig trees are naturally pollinated by fig wasps, who enter the fig fruit which is where the flowers are. When a female wasp forces her way into the fig fruit, she both pollinates the flowers and lays her eggs (then she dies). The wasp eggs hatch when the fig is at a ripened stage. This is something to keep in mind if you are picking figs off a tree. 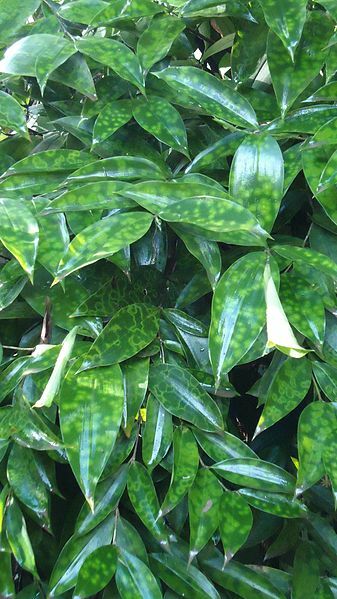 Weeping fig, Ficus benjamina, is a common and popular house plant. Although naturally a large tree, it’s long been cultivated as a much smaller indoor house plant, including in bonsai form. A lot of people have one or more of these plants in their home. The ASPCA lists Ficus benjamina (commonly called the Weeping Fig or Indian Rubber Plant as toxic (or at least highly irritating) to dogs, cats and horses. Again, information for birds doesn’t exist but the wisest option is to keep birds away from the house plant Weeping Fig (Ficus benjamina). The old “if in doubt, then don’t” rule can apply here. Some Ficus trees, including the more common ones like Ficus elastica, Ficus carica, Ficus Lyrata and Ficus benjamina have a sap in the branches, While not known to be toxic, it is known to cause skin and gastrointestinal reactions in dogs and cats. While no information exists for birds, one will likely want to reconsider using any sap-producing branches as perches for parrots. There are countless other safe and easy to grow options for bird perches and wood for parrot enrichment and toys. Venus Flytraps are amazing and unique carnivorous plants that snap closed to catch and “eat” insect prey. They are native to North and South Carolina in the US, but are cultivated around the world in horticulture, so you’ve probably seen them for sale at your local garden center. There would be no reason or benefit to provide such a plant to a parrot, whether as an enrichment or planted in aviaries. Venus flytrap plants are small plants which provide little to no value to parrots – and the fact that they can live up to 20 or even 30 years means that allowing a parrot to destroy one in seconds would be rather disappointing! So if your parrot has happened to come into contact with a Venus Flytrap plant, is it a hazard? Venus Flytraps are not toxic or poisonous plants. 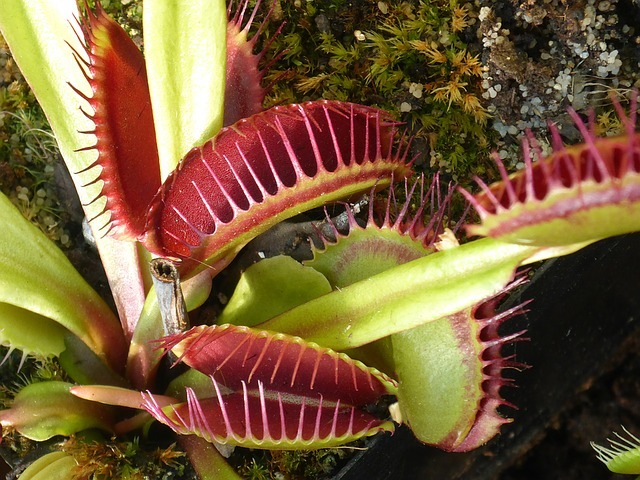 Unlike other plants which might have a toxin activated to protect itself against being eaten, flytraps use the trapping mechanism as a defense. Could this hurt a parrot? No. The plants are powerful enough to trap insects, but a parrot is no match. It’s most likely a parrot would have a Venus Flytrap destroyed before it could even have a chance to close itself. The ASPCA lists the Venus Flytrap (scientific name Dionaea muscipula) as being non-toxic to dogs and cats. So while this plant isn’t known to be hazardous, there is no beneficial reason to give access to it to birds in captivity. Are orchids poisonous or safe for parrots? It’s important to know whether any plants in your home or aviaries could be toxic to your birds. There are thousands of orchid species. The Orchid plant family (Orchidaceae) contains around 28,000 species! They are one of the largest families of flowering plants in the world. And inside the orchard family there are currently over 760 recognized genus groups (genera). This diversity means that when you say the word “orchid” you could literally be talking about any one of many thousands of species. 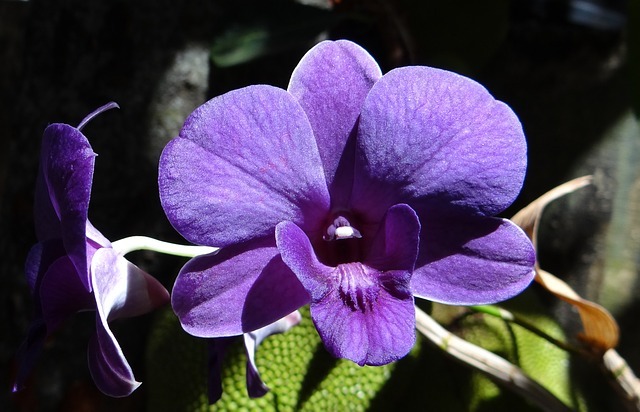 To make matters even more confusing, the horticulture industry, which has a great love of orchids, has over the years created more than 100,000 cultivars and hybrid orchard plants! These are the ones that you are most likely to find at your local plant nursery, often under a range of different names. Orchids are spectacular plants and it goes without saying that they are hugely popular as garden and house plants. Their beauty is really unmatched in the plant world. But are orchids safe for your parrots to be around? Unlike many other plants, orchids are unlikely to be something that you will want to grow specifically for your parrots. Their delicacy and fragile beauty (not to mention the often experienced difficulty in growing) would go to waste on a bird that would literally have it destroyed in seconds. They don’t provide the enrichment that other plants can. But if you have orchids growing in places that your parrot has access, then you will just want to feel confident that they won’t be a hazard if your bird happens to explore those lovely bright coloured flowers. Orchids in general are not considered toxic for birds. If the plant has had any fertilizers, herbicides, pesticides or any chemicals put on it the needless to say it should be kept out of the reach of parrots. This goes for any plant! Essential oils are a highly concentrated form of plant extract. Most people do not recommend or advocate the use of any essential oils on or around birds in any form due to the unknown, unstudied, and potentially high risks to the health and safety of parrots. There is no scientific data to prove that essential oils are safe or beneficial for use around birds. We do not support the use of essential oils around parrots. 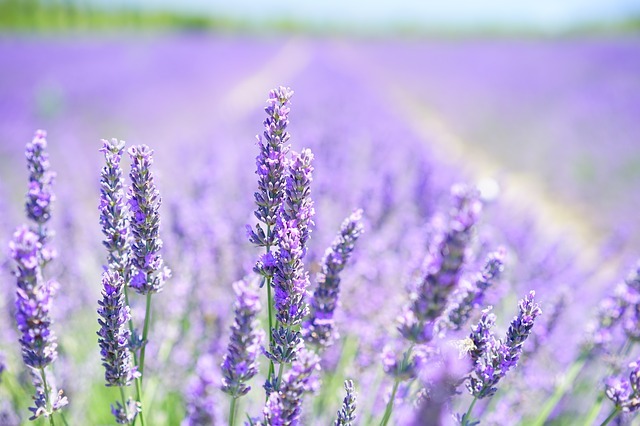 Of great interest is the lavender plant itself, and whether it’s a type of plant that you can give to your birds for enrichment or have growing in an aviary environment. Lavender plants are safe for parrots. Lavender is a beautiful plant and one that many birds would naturally be attracted to if given the opportunity. Lavender plants are actually part of the mint family. While there are almost 40 species in the lavender genus (Lavandula), the most well known and widely cultivated one is Lavandula angustifolia. That’s the one you’ll recognize by its gorgeous purple bee-attracting nectar rich flowers. Some people use the dried lavender buds in cooking. Lavender plants grown organically and without chemicals, fertilizers or other pollutants can provide safe and exciting enrichment for parrots. Although it’s generally the smaller birds that will enjoy the dainty, delicate flowers, it is a plant that you can safely harvest and provide for any of your parrots to nibble on and play with if they so wish! 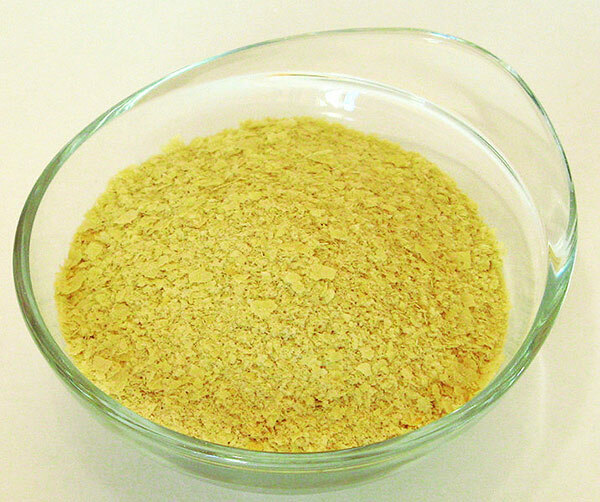 Nutritional yeast is an ingredient used in cooking and as a topping on meals. It’s basically a deactiviated form of a certain yeast and is usually sold in flake or powder form in health food stores and online. Nutritional yeast is a dead yeast, and has nothing to do with yeast infections that can afflict birds. Note: nutritional yeast is not the same as brewer’s yeast (the type used for making beer) or active yeast (for making bread). While brewer’s yeast is also edible in a similar way to nutritional yeast, the taste is rarely considered as favorable. Active yeast used for bread making and baking however, should never be eaten by humans or birds. It has a nutty or cheesy type flavor which is why it’s so popular amongst vegans and people who are lactose-intolerant, because it can be used as an ingredient in a plethora of cooked meals, often replacing cheese and creamy ingredients. Although it’s not particularly appetizing to look at, nutritional yeast is actually quite nturitional: protein, fiber, and some small amounts of vitamins (mostly some B vitamins) and minerals are all found in it. Some nutritional yesat products are also fortified with vitamin B12. But is it safe to feed foods to your parrots that you’ve added nutritional yeast to? Yes, it’s not a dangerous food. When used in normal quantities as you would feed to yourself (adjusted for your bird’s size), nutritional yeast is safe for birds. Some vets may even recommend it as a natural B-vitamin supplement. Like any other food, it shouldn’t be used as a large portion of your bird’s meals, but rather as an added nutritional ingredient (which is what it’s designed for) used in moderation and sparingly. Some basic information regarding nutritional yeast in regards to supplying it to parrots can be seen on this page. 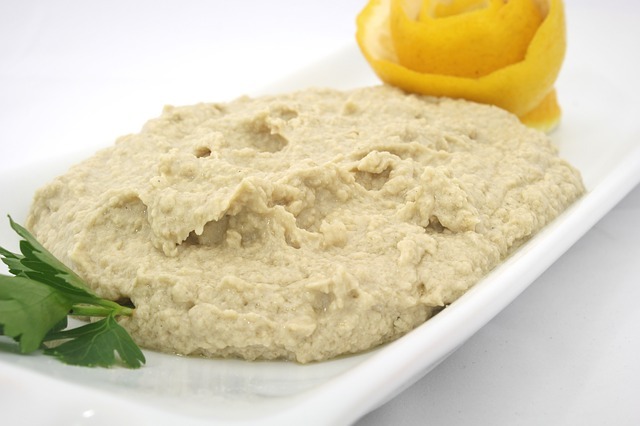 Home made hummus and store bought packaged hummus can vary in the ingredients used. A lot of pakaged hummus products have extra flavors added, like herbs and spices as well as salt. The safety of garlic for parrots is always often debated amongst bird owners. Many think it’s fine to feed some garlic, while most people put garlic in the same category as onions; in other words, a no-no for birds. At SafeForParrots.com we err on the side of caution and believe it’s better to be safe than sorry, due to the lack of data and unknown possible risks of feeding garlic to parrots being too high. With so much other safe, nutritious foods to feed parrots, there seems little point in taking the chance of feeding garlic. Additionally, most packaged hummus recipes (and even home made) have added salt. Therefore, hummus is a food best avoided by parrots as well. Mealworms are beetle larvae, of the species Tenebrio molitor. Mealworms are a regular part of the diet in captivity for softbill birds like finches, especially during the breeding season. But what about parrots? While there is no doubt that many parrot species eat insects and insect larvae in the wild, the energy and breeding dietary requirements of wild birds differ considerably to those of captive parrots. Mealworms are a rich source of protein which is why they are fed to breeding finches and the like; birds which have a high component of insects in their natural wild diet, particularly during the breeding season. 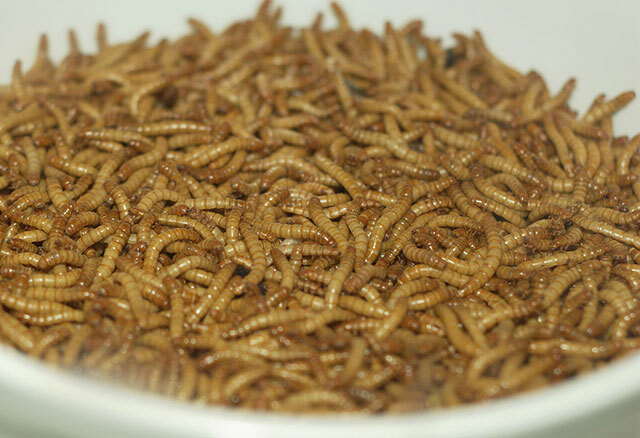 The nutrition of mealworms is heavily reliant on what they eat. Many people feed their mealworms on bran only, while others will use vegetables and high quality insectivore mixes which increases the protein and nutrition level even more. But mealworms are not considered necessary or even healthy for parrots in captivity. They have a poor calcium to phosphorus ratio (high phosphorus and low calcium), and have quite high fat and calorie levels. High amounts of protein in a diet can bring about hormonal changes that lead to an onset of breeding behaviors. This is something that companion parrot owners like to avoid, for good reason – for the sake of the health of the parrot, as well as the sanity of the human caretakers. With the availability of formulated pellet diets, concerns of whether companion and captive parrots are “getting enough protein” are considered to be unfounded. When a quality formulated pellet food is given as part of the diet (with the rest being made up of fresh vegetables, legumes, fruits and other natural foods), introducing insects like mealworms to the diet is not recommended by any avian veterinarians that we are aware of. One or two mealworms here and there? Like most other treats, an occasional mealworm isn’t going to cause a great effect on a parrot in terms of protein consumption. Keep in mind that finch owners feed live mealworms, since finches are accustomed to live insect prey. Compared with finches and other softbill birds, parrots in the wild eat very few insects compared with their main food sources. Mealworms, insects and meat are not a requirement of a healthy parrot diet. Each individual parrot should be considered on its own, and advice sought from an avian veterinarian if you are concerned about the protein aspect of your bird’s diet. The milk of cows or any other mammal is obviously not a natural dietary item for parrots in the wild. Neither is cheese or any other dairy based foods. These are foreign foods to parrots and not something they’ve ever evolved to consume or process. Birds don’t have the required enzyme (lactase) to process lactose. Even large numbers of humans are lactose intolerant; and the body of a bird is a completely different system to that of humans and other mammals. Yet people still sometimes ask the question of whether it’s ok for parrots to drink milk, or whether they can eat any foods containing milk, such as cheese, ice cream and dairy yogurts. You’ve probably read people talking about how their parrot “loves eating cheese”. And even if a small amount of cheese isn’t causing any noticeable side effects in a bird, what’s it doing to their insides? As avian veterinarian Dr. Ellen K. Cook states, “dairy products are not very compatible with a parrot’s digestive tract”. She goes on to say that while parrots may not be 100% lactose intolerant, they do not digest dairy foods and drinks (anything containing lactose) and it’s clearly not a recommended addition to the diet. Every bird is unique. What causes no (obvious) harm in one bird, can have grave consequences for another. As an example, a parrot rescue group in the UK details the alarming effects on an African Grey parrot who had been consuming cheddar cheese in his diet. This is a very informative article and is well worth reading. Cow’s milk, and any other animal derived milk, is not OK to include in a parrot’s diet. While very tiny amounts of ocasinoal yogurt or hard cheese appears to not cause harm in some birds, there is little reason to be feeding risky, unnatural foods to animals which have not evolved to process them. Newspaper is safe for parrots. Newspaper is a safe, effective, low cost and low maintenance cage liner. It’s the most common choice of cage liner and is easily changed out once a day (or more for messy birds). It should be kept in mind that only clean, dry newspaper should be used in cages. Damp, dirty, or otherwise spoiled newspaper could harbor bacteria, fungus and other nasties. Old, yellowing newspapers should also be avoided for these reasons. Newspaper is biodegradable. The concern about whether newspapers can be toxic to parrots focuses on the inks used in the print. This mostly comes about because back in the old days (decades ago), newspaper ink often contained highly toxic and dangerous components like lead. In developed countries at least, lead use in ink is very much a thing of the past. Old time ink was also based on petro-chemical materials, but nowadays more eco-friendly ingredients are favoured. Particularly soybean oil. Modern newspapers use ink that is based on soybeans. While the issue of GM soybeans are a concern for people (especially organic farmers who want to use newspaper in their gardening strategy), this is not going to pose an issue for parrot owners who use newspapers to line bird cages. Is it safe for parrots to eat newspaper? When people see their bird shredding up newspaper – and this is extremely common and something that most birds LOVE to do – it’s understandable to wonder whether they’re eating the paper or just ripping it up. Shredding clean newspaper doesn’t pose a risk to a parrot’s health. Most birds are unlikely to be eating the paper, but if you think your bird is swallowing it it’s important to find out why. If a parrot eats newspaper, the greater concern would be blockage or obstruction in the crop rather than toxicity. Additionally, a visit to the vet can be in order to see if there are any underlying issues that might cause a bird to want to consume newspaper or other non-food materials. It could be a dietary, behavioral or health problem. Needless to say, encouraging or standing by watching a parrot eat newspaper (or any other paper) should be avoided. If a bird is attempting to eat paper, consider whether a dietary deficiency or health issue is bringing about the urge and make an appointment with your vet. Newspaper is safe to use as cage lining for parrots and can play an important role in keeping cages clean and hygienic on a daily basis. It might be hard to believe that someone would ask this question; but occasionally people do. The real question to ask is: why would anyone want to give dog food to their parrot? Parrots who have access to a dog food bowl, particularly dry food or kibble, might be tempted to investigate. Many people have talked about their birds “loving” dog food. But serious questions need to be asked about the risks involved, considering the often highly questionable ingredients used in many dog foods, including preservatives, by-products and other chemicals and additives. More and more people are questioning the suitablity and safety of feeding commercial dog food to dogs themselves; let alone birds. This page provides an informative list of just some of the many questionable and downright dangerous ingredients that are so often used in commercial pet foods. The short answer is that dog food should never be given to parrots. With so many nutritious, healthy, wonderful safe foods to feed pet and aviary parrots, dog and cat food presents an extreme and unnecessary risk to animals that have certainly not evolved to eat such products. Dog food is not safe for parrots. Orgreenic cookware is labeled as non-stick, which naturally makes you automatically think of the dreaded toxic Teflon which bird owners must stay right away from. 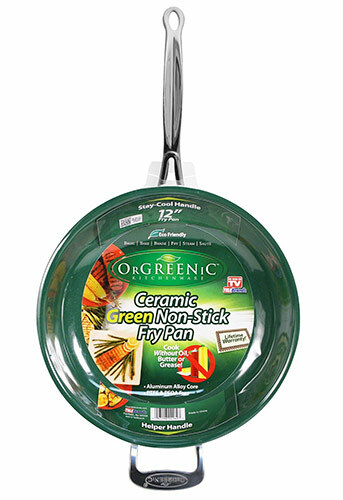 But Orgreenic products do not contain a PTFE or PFOA based non stick surface like teflon products. The company instead describes it as a “revolutionary ceramic coating” technology. The non-stick surface on this brand of cooking products is described as PTFE and PFOA-free and non-toxic. Ceramic cookware is a long time favorite choice for people with birds in the house, but one of the issues people have is that regular ceramic isn’t really non-stick, in the way that Teflon is. So the Orgreenic line looks appealing in that sense, especially if you like frying. These pots and pans have an aluminium core and a thin ceramic coating. Unfortunately, Orgreenic does not have an official website and it’s difficult to find any information regarding the company behind the products. It was originally an “as seen on TV” type product, with quite a bit of hype surrounding it. There are quite a few reports out there from people who have bought Orgreenic cookware and it didn’t stay non-stick for very long. Whether this is because they didn’t “season” the pan when they got it, or failed to use it as intended is unknown. This article is not a review of Orgreenic products, but if you are thinking about their line of cookware as a bird-safe option, certainly do your research and read the reviews out there (both good and bad) before deciding. So, although there’s no reason to think that there are any toxic materials used in Orgreenic pots and pans, the products have a questionable ability to work well as a non-stick product over time. They are low cost and it is unreasonable to expect a top quality, durable product at this price. Certainly many people are happy with their ceramic coated Orgreenic cookware, but others are happy to stay with stainless steel, cast iron and other traditional products that are known to be both safe, reliable and long lasting. 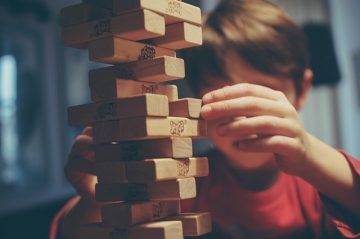 Jenga is a game played with wooden blocks, where the (usually human) players have to remove one block at a time from the tower, without letting it fall over. Along with the familiar Jenga game, there is also a Jenga Giant version with much larger, hardwood blocks (the price of this game is unlikely to make it a candidate for a bird toy). Because the blocks are made of wood, a lot of people wonder whether this would be something safe to allow a parrot to play with – whether as part of the game, or just to chew on the blocks for fun as they are convenientialy a perfect size for most parrots to use them as a foot toy. But is this a safe type of wood and has anything been added to it that could potentially make Jenga blocks unsafe for birds? Most (possibly all – but this information isn’t always easily available) Jenga products are made in China. Many parrot owners choose to avoid any and all products made in China. There can certainly be many unknowns in terms of materials and manufacturing processes so this position is wise and shared by many people. The blocks are described as being polished hardwood, so likely have some sort of lacquer applied to the wood. Therefore this isn’t something that should be considered healthy for a parrot to play with. Why take the risk? Keep in mind that there are other similar and copycat games out there like Jenga under different brands and names. These could use different types of wood, glues, paints etc which may not be safe for birds to touch and bite into as well. Before letting your parrot have any made-for-people toys and games, find out for certain what it’s made of and whether the wood is raw. If not – leave it to the humans of the family and get your parrot something bird-friendly instead. With so many lovely wood options out there, we don’t have to take risks. 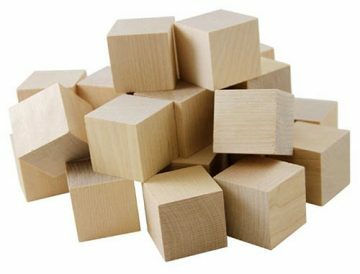 Something like these wooden cubes, made of untreated hard wood, are perfect for parrots that have an unstoppable urge to destroy wood! that he developed this behavioural trait that our veterinary bird doctor can find no obvious cause for. Kay-tee exact rainbow and Avi-plus extruded maintenance, and black and white Sunflower seeds. I am most concerned that he is not in optimal health. After much contemplation I am now looking toward the discontinuation with immediate effect of the Granadillas of which may contain too much acidic content and be the cause of this complaint. and may be detrimental to his health and well being in the long run. the same effect on our birds. now has to spring to mind with his ingestion. good enough for my bird , I feel obliged to remove the offending agent, of which I cannot be certain of. I would highly appreciate your view on this subject. 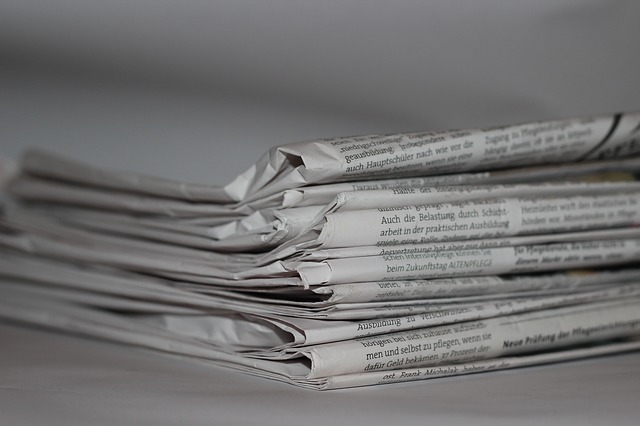 Hi- newspapers are now usually made of recycled paper which have thermal receipts in them. BPA. Nasty stuff! Also now in our recycled toilet paper and tissues. It will get on a parrot’s tongue, won’t it? You can buy non-recycled paper roll ends to use in the cage bottom instead – and for just shredding fun, maybe old damaged books from a library? Re: newspapers, is anything really ever 100% safe these days Karin, unlikely thanks to widespread contamination particularly from plastics. However newspaper is considered far down the list of risks to parrots we would think; certainly almost everyone uses it for cage lining and the like. As for library books, I would consider these to be very risky health wise – consider the number of people who have touched them, books kept and exposed to unknown environments, and of course mold spores.